This class is designed for students interested in becoming familiar (or more familiar) with Shakespeare's work, with no prior experience required or assumed. We will study eight of Shakespeare's plays, including some of his greatest and most famous: tragedies like Hamlet, King Lear, and Othello; comedies like A Midsummer Night's Dream, The Merchant of Venice, and Measure for Measure; the history play Henry the Fifth, and the late romance The Tempest. Our focus will be on the structure and language of the plays, their dramatic form and genres, and their relations to the social and political tensions of Shakespeare's time. 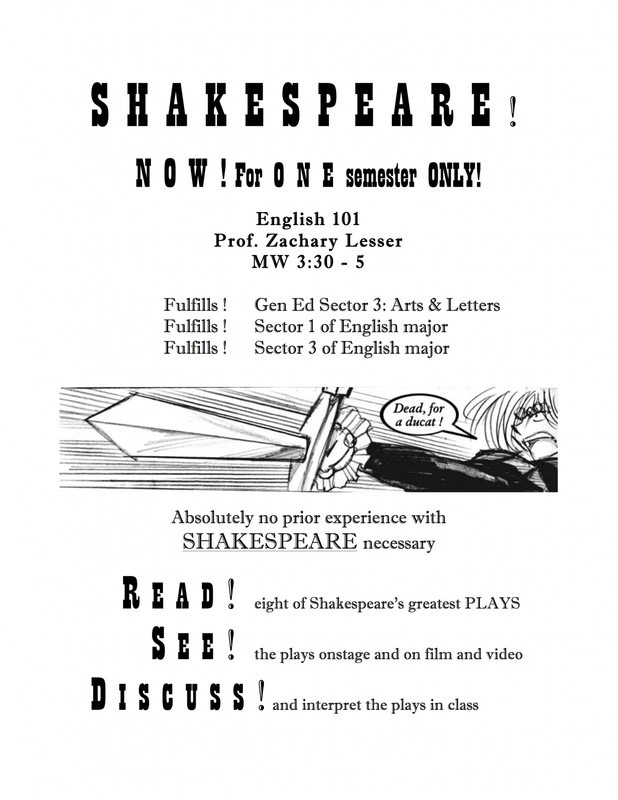 The course centers on close readings of the texts and is designed to develop facility in reading Shakespeare's language and in dealing critically with the issues raised by the plays, but our readings will also be supplemented by historical texts and contexts, performance and theater histories, as we attempt to place the plays in their historical moment as well as in our own. Classes will be structured as a combination of lecture and discussion. Requirements: attendance and participation, midterm exam, final exam, and two papers.